A tick being tested for disease. 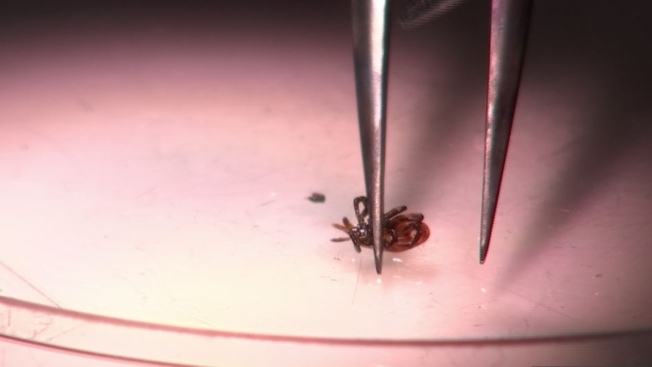 Ticks are out and about in New Hampshire, and health officials are reminding residents that they can cause more than Lyme disease. State statistics show over the last few years, the number of Lyme disease cases in the state ranged from 1,301 in 2011 to 1,689 in 2013. For 2015, the most recent year for which data are available, there were an estimated 1,373 Lyme disease cases. There also were 110 cases of anaplasmosis, caused by a bacterium, and 53 cases of babesiosis, caused by a parasite. There have also been two cases of the Powassan virus reported, the first in 2013 and second in 2016, but it's not known if these were acquired in the state. Precautions include using an insect repellent containing DEET or oil of lemon eucalyptus, wearing protective clothing, and doing daily tick checks.